By 1907 Maillart's reputation was established. He had taken his company Maillart & Cie from hardship to profitability and recognition in five years. His success was founded in his expertise at transforming concrete into pared-down structures of great strength and grace. Anything superfluous was deliberately left out. However, while he was off working and travelling to oversee construction, his wife Maria seems to have felt isolated. She spoke Italian and French but hadn't mastered Swiss German. She spent long periods away from home with their two children, visiting friends and family, mainly in Italy. Maillart found Maria's moods difficult to understand and reacted by immersing himself in work. During his career, Maillart lectured extensively on reinforced concrete and helped to formulate design codes that would be used into the 1930s. He believed practical analysis was always better than theoretical calculation, and that load testing of a finished structure was crucial to a full understanding of its behaviour. During 1908, he focused his attention on building engineering. At the time, buildings constructed in line with François Hennebique's (1842-1921) reinforced concrete design methods had frames of primary and secondary beams connected to columns, all supporting the floors. In his scheme for the 1905 Pfenninger factory at Wädenswil, Maillart had dispensed with secondary beams. Now, taking a step further, he explored the possibility of eliminating beams altogether and carrying floor slabs directly on columns, with enlarged heads to absorb the greater forces and bending moments at the junctions. The beamless system has several advantages, as well as elegance. It uses less concrete and steel and so is cheaper to construct, it gives greater headroom for the same storey height and it reduces unusable space. This system, with its splayed column tops, was known as 'mushroom columns' or 'mushroom slabs'. The idea was not unique to Maillart, though he did come to it independently. 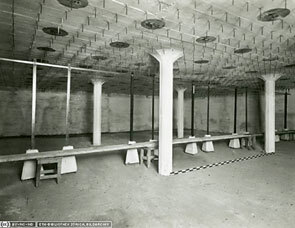 As early as 1905, American structural engineer Claude Allen Porter Turner (1869-1955) was testing mushroom columns. In 1906, the Marshall Building in Milwaukee, Wisconsin, was constructed to his structural design, with four-way spanning reinforcement over the column heads. This building still stands. Turner filed for a patent on his columns on 11th June 1907 and it was issued on 12th September 1911 (US patent no.1,003,384). Meanwhile, in Russia, mathematician and contractor Artur Ferdinandovitch Loleit (1868-1933) was designing mushroom slabs with two-way spanning reinforcement. In 1907, Loleit used his ideas in the Bogorodsk Glukhovskoy Textile Factory near Moscow, building fluted-topped columns with circular skylights between. Maillart's mushroom slabs also had two-way spanning reinforcement but his columns had larger capitals than those devised by either Turner or Loleit. It's not clear exactly how much Maillart knew about their work though it seems likely that, through the community of reinforced concrete engineers, he would have been aware of their efforts. Maillart began testing his version in 1908, building a series of large-scale models at the Maillart & Cie construction yard in Zürich. A year of testing convinced him that his system worked and, on 20th January 1909, he obtained a Swiss patent (no.46,928) for "the beamless deck". It was to be very successful, enhancing Maillart & Cie's reputation further and bringing in a steady income. In August 1909, Maillart & Cie won the contract to build offices and an adjacent 10m high retaining wall for Otto Adler & Cie in St Gallen (Adler offices and wall). The wall had been designed by Swiss architect Wendelin Heene (1855-1913) as a solid concrete monolith that relied on its mass to resist overturning. Maillart showed his passion for economy and functionality, even for structures that would be mostly hidden. He redesigned the retaining wall as a thin shell of reinforced concrete, using just 23% of the concrete in Heene’s design. On 31st October that year Maria gave birth to their third and last child, a son they called René (1909-1976). By this time, the family was settled in an apartment on Hochstrasse overlooking the northern end of Zürisee (Lake Zurich). Maillart's recently widowed sister Rosa Wicky (1865-1950) was a frequent visitor. Also that year, Maillart was involved for the first time on a project outside Switzerland. He worked with fellow Swiss engineer Conrad (Conradin) Zschokke (1842-1918) on the design of concrete caissons for Venice in Italy, presumably as part of the city's flood defences. Zschokke had invented the displaceable caisson in 1878 and his eponymous company (founded 1872, now part of Implenia) was based in Aarau, capital of German-speaking Aargau canton in northern Switzerland. In 1910, Maillart's first building with a beamless floor slab was constructed — a five-storey warehouse at Giesshübel in Zürich. Between 1910 and 1912, Maillart & Cie constructed 11 large projects using the beamless slab system, and it was used in more than 50 of Maillart's buildings during the course of his career. A notable example is the filter building at Rorschach water treatment plant in St Gallen canton (completed 1912, demolished 2010). Unusually, it had a sloping roof, covered with earth for insulation. The partially submerged columns had flared capitals and bases, though the bases were covered by sand filter beds. Maillart also found time to tackle further bridge schemes. 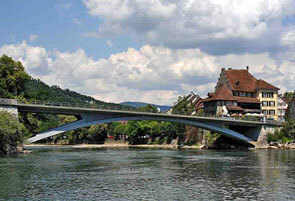 By 1912 he had seven bridge contracts in hand and had become Switzerland's leading builder of bridges. One of these was the 67.8m span Aarburg Bridge over the Aare River in Aargau canton, northern Switzerland. In September 1912, Maillart decided he could afford a house and purchased Voltastrasse 30 in Zürich not far from the rented Hochstrasse apartment. The detached five-storey house is still there and has changed little on the outside since 1912. The purchase marked a new contentment in the family. Maillart bought a car, Maria was happier and the couple hosted dances, and dinner parties followed by card games. That same year Maillart designed a three-hinge reinforced concrete hollow box cantilever beam bridge, spanning 36m over the Muota River at Ibach in Schwyz canton (Ibach Bridge). Completed in 1913, it was to be Maillart's last Swiss bridge for 10 years. Switzerland is a relatively small country, with a population in 1912 of only 3.8 million. Proportionately few large building contracts were being commissioned and Maillart realised that bigger opportunities existed elsewhere. Russia, Spain and France seemed especially attractive as they were undergoing rapid industrialisation. One of his former classmates, a Russian named Benjamin Person (1867-1937), was enjoying a lucrative career as a builder in St Petersburg. He encouraged Maillart to explore the possibilities of working in western Russia. On 15th April 1912, Maillart arrived in St Petersburg for the first time. He would make ten further trips to Russia by July 1914, before moving with his family to Riga (then in Russia and capital of Latvia from 18th November 1918 onwards). 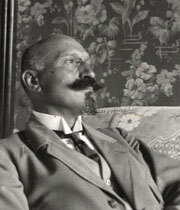 Maillart undertook more than ten major contracts in Russia before 1919, when he returned to Switzerland. His first, in 1912, was as subcontractor to Person’s company for a refrigerated warehouse in St Petersburg. Maillart was on the brink of great wealth but his time in Russia was to bring mixed fortunes, grief and personal danger. Meanwhile, in September 1913, Maillart opened an office in Barcelona on Spain's north Mediterranean coast — a shrewd decision that led to a number of contracts. The first Spanish commission was was the construction of the Pirelli cable factory (completed 1914) at Vilanova i la Geltrú. Maillart sent one of his best young engineers to supervise the work. He also constructed another 12 industrial buildings in France and Spain between 1913 and 1918. A mushroom slab by Claude Allen Porter Turner (1869-1955) constructed in the USA, as shown in an early 20th century advertisement. Turner was independently developing beamless slabs a few years before Maillart starting testing. 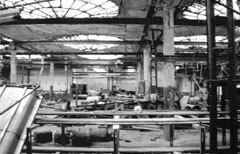 The interior as found in 2002 of the Bogorodsk Glukhovskoy Textile Factory (1907) near Moscow, designed by Artur Ferdinandovitch Loleit (1868-1933), another independent developer of beamless slab design. 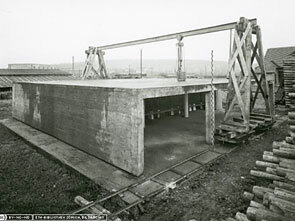 In the Maillart & Cie construction yard in Zürich (location unconfirmed), Maillart began testing beamless deck slab designs in 1908. The photo shows a pre-patent slab test in 1909. A patent was granted in January of that year. 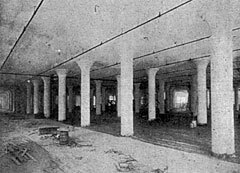 The 'interior' of the same deck slab test structure in 1909, showing the 'mushroom' columns. The Aarburg Bridge (Aarebrücke, 1912) over the River Aare in Aarburg, Switzerland. A comparatively deep hingeless arch. Originally, a series of transverse walls on the arch supported the deck. In 1968 these were removed and the bridge remodelled somewhat. 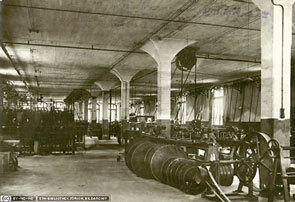 The Pirelli cable factory (completed 1914) at Vilanova i la Geltrú, Maillart's first project in Spain.